On June 27th, 2012, Lezlie Sage of Best Friends Animal Society called Sylvia Moore of Tuba City Humane Society, and said Best Friends was in a dilemma. 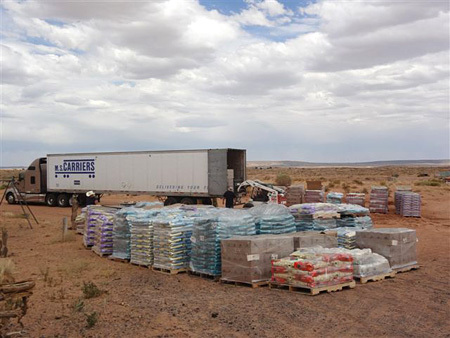 The Blue Buffalo Co. had two semis full of dog, puppy and cat food to donate but Best Friends had no place to store it. So Sylvia said go ahead and send it to her ranch in northern Arizona. 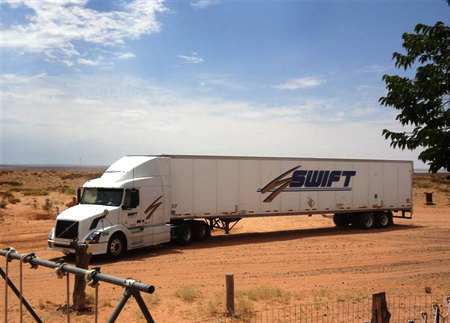 Sylvia knew there would be enough room for the trucks to be able to drive in and turn around, but she also knew they would need a lot of equipment and help to deal with the massive size of this donation. 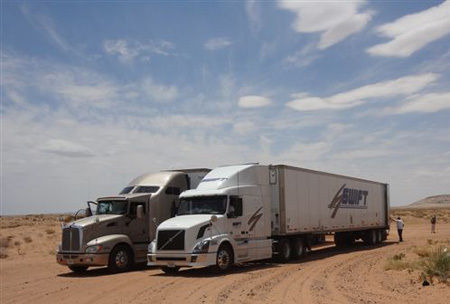 The two Swift Trucking semis left Oklahoma on Friday to deliver the food and arrived on Monday, July the 2nd. 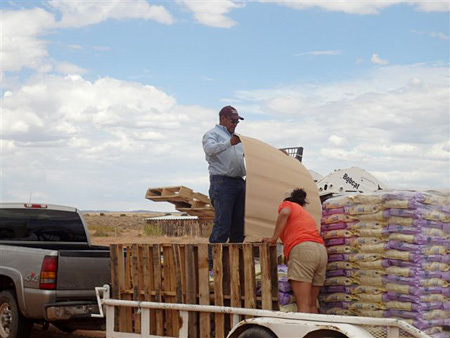 Sylvia’s husband, Willie, borrowed a bobcat from Dr. Holgate’s husband Elward, and Frank Begay, another friend in Tuba City, had forks and a pallet jack. Elward and his nephew Eugene Nelson and Frank and his two sons Mike and Frank Jr. all came to help. Franks wife Marva and Sylvia fixed iced tea and lunch for the drivers and the helpers. 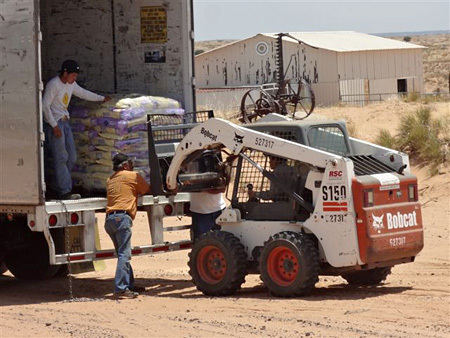 It took three hours to unload both trucks and then there was 68,066 lbs. 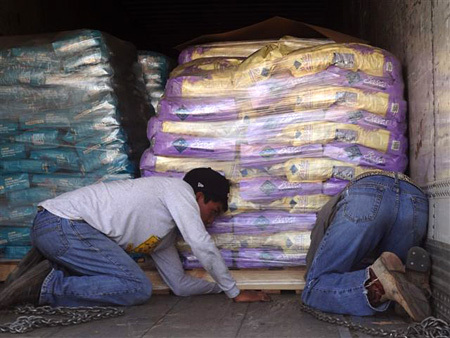 of food (worth $247,000) stacked on pallets. This was an unprecedented donation from Blue Buffalo. Lezlie and Sylvia got on the phone and called humane societies, rescues and chapter houses. 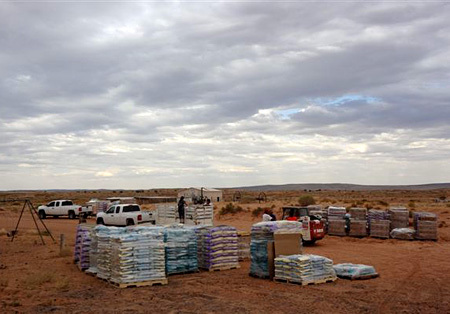 They reached Gallup's McKinley County Humane Society, Yavapai Humane Society, Kendra Wapaha from the Navajo Nation Puppy adoption program and Dr. Begaye from the Kayenta Animal Care Center, who all came and got as much food as they needed. Dr Holgate and the Tuba City Humane Society won't have to buy food for rescues for a long time. 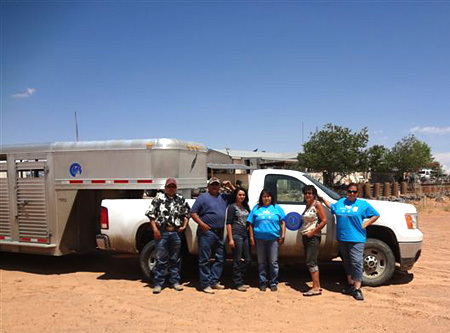 Chapter houses from Tonalea, Monument Valley, individuals who rescue and foster on their own and dozens of people who live in the Kaibeto and Tonalea area came to get food. Depending upon how many dogs and cats they owned, the food was distributed accordingly. They were also asked who their veterinarian was, and and if their animals were spayed/neutered and vaccinated. It was great to see how many see Dr. Holgate as their veterinarian and that they had all their animals fixed. It took two weeks to distribute all of the food. 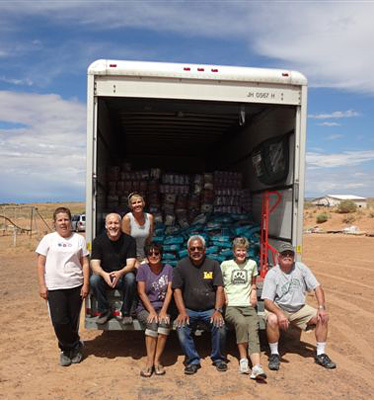 Towards the end of that time, Yavapai Humane Society came and took their share and all the food has been dispersed. Without all of the collaboration and work of Blue Buffalo, Best Friends Animal Society, Tuba City Humane Society and Dr. Carol Holgate, this would have never happened. An amazing amount of animals have and will be helped and many local rescues won't have to spend money on food for a long time, allowing them to rescue even more animals. Thank you to Blue Buffalo, Best Friends Animal Society, Tuba City Humane Society, and Dr. Holgate, and everyone who helped make this possible!